Today’s tech-enabled world thrives on content, digested through social, digital and mobile channels. One-time fads have either evolved into mainstays or disappeared into the abyss. And as the mainstays continue to evolve, they spur trends of their own. Some are a natural evolution, a continued emergence of staples in traditional marketing. While other underscore the changing scene of B2B marketing and the continued emergence of new and advanced content marketing and distribution methodologies. Telling a digital marketer today that video is important is like telling a blogger 10 years ago, “Words can be really helpful.” Thank you, Captain Obvious. When execution is on point, video engages consumers. It brings tangible results and quantifiable ROI. Snackable videos – like livestreams, video blogs and client testimonials, are preferred by consumers as much as four times more than text content. Video is the most thoroughly consumed content format today. But as this digital marketing trend becomes a focal point to our strategy, we need to look at the “why” of which we’re engaging people. Good nonfiction storytelling in the business arena has the power to make your audience crave to believe in your brand. It creates an insatiable desire to be in your squad. But our stories must be lifted off the pages of our strategy. We must bring the stories that embody our brand to life. Don’t get me wrong, writing is still a foundational piece of your content marketing strategy. But video stories and visual engagement will boost conversions. No company sells to another company. Not really anyway. We sell to a specific person who works in another company, and who can benefit from your product or service. So get specific in both your content marketing and distribution, and market to that person. Digital marketers who put insanely personalized campaigns into motion this year will drive better results. The benefits of personalization are mighty: Higher responses, better conversion rates, brand loyalty, repeat customers, amplified reach and boosted relevance, to name a few. And by targeting our content marketing and distribution based on segments, or even as granular as individual recipients will reap higher results. Our audience’s attention span is a finite resource. And it’s pushed to the limit every minute of every day. 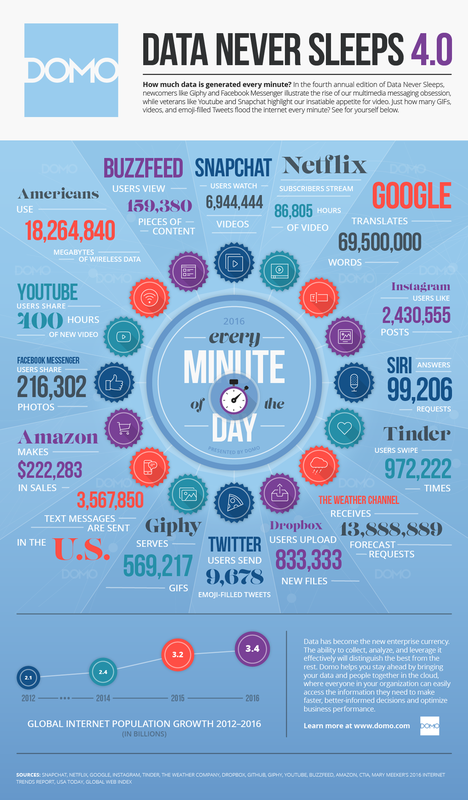 Just take a peek at the crazy infographic from our friends over at Domo. More than 216,000 pictures are shared every minute on Facebook Messenger. Almost 10,000 emoji-filled tweets are sent, and Siri answers 99,200 questions – every minute! That’s a lot of content marketing and distribution, and somehow you must find a way to stand out. Marketing teams are tapping into every resource they can to have the time, energy, brainpower and budget to create new and engaging content. But great content has to find its audience. Consumers are littered with mountains of mediocre content tangling the interwebs, making it almost laughable some marketers still just put their work into the world with hopes of getting it seen. The way we distribute our content needs to be more strategic. We need to get smarter if we want people to see through the clutter of everything-ness, to realize what we have to offer. Sure, we’ll keep hitting up the usual activities. We’ll share to our social platforms and send out an email campaign to our already-collected list of loyal followers. Then we’ll encourage our employees to share. But what about new visitors? We need to look at new channels, like email signature marketing. The idea is to put your content inside of your email signature so it can reach your most important contacts through human email at any stage of the funnel. The average worker sends around 40 business emails a day, according to a study from The Radicati Group. For a company of 500, that’s five million emails which can deliver branded content, tailored to who’s going to see it. Native ads are the hipsters of advertising. In other words, they’re the “I’m not an ad,” of advertising. They look and feel natural in their environment but subtly position branded messaging internally. And they’re favored by consumers over the in-your-face hard sell tactics. In fact, a study from Sharethrough showed people respond 53 percent better to native ads than to traditional display ads. Ad blockers and a general foul flavor left in the mouths of our consumers after years of too many pop-ups and display ads have made it tough to reach customers with a hard sell. Push advertising is fading. Traditional digital marketing will soon be completely replaced by native advertising. Native advertising is unobtrusive and delivers content (yes, real, valuable content) that could almost be mistaken for an organic post, yet are clearly marked by brands as sponsored. Consumers love ‘em because they’re not an annoyance or distraction in their daily lives. Instead the ads provide real value, be it education, entertainment or otherwise. Digital marketers are going nuts over them because they fit almost anywhere. And they’re more digestible. Though advertorials in journalism have always been a popular mend between valuable content and advertising, brands like The Onion and BuzzFeed are paving the way for sponsored content in the modern marketing landscape. BuzzFeed’s primary business model is native advertising. They make money by selling posts, videos, quizzes and other kinds of content that match the tone of its editorial content. My favorite right now is this Mother’s Day gift guide disguised as a quiz, sponsored by Nordstrom. A staggering 61 percent of enterprise buyers say the sales people they work with add no value to the buying process, as reported by research from Forrester’s sales enablement group. Now more than ever, sales reps need to rely on the right content, sent at the right time, to support their sales conversations. Low value sales reps aren’t going to be invited back in second calls. They’ll fail to gain trust and learn the pain points. And they won’t lock in the sale. But one in every three sales reps say they struggle daily to find the right collateral to close a deal, according to a study from Brainshark. They’re weeding through hundreds (sometimes thousands) of posts to find something, anything, applicable. And when they finally find a piece, they lack the confidence to know it really is the right material for their particular situation. We need to invite sales to the marketer’s lunch table and together craft stronger enablement to have cohesive messaging and positioning through sales, your business development team and through customer success. Every department needs to be on the same page and marketing needs to lead the charge. Email has died a million deaths. It’s the internet’s read-headed stepchild, neglected and taken for granted. And yet, it’s still an integral part of how we communicate. Last year, more than 215.3 billion emails were exchanged each day. And research predicts we'll be exchanging 257.7 billion emails a day by 2020. Nearly three-quarters of adults say they prefer to communicate with companies via email, while 91 percent say they enjoy the promotional emails from companies they do business with. In the B2B space, 73 percent of companies agree email marketing is a core piece of their marketing strategy. And about a fourth of them rate email as their top channel in terms of ROI. Not to mention, most business professionals in the U.S. spend around 6.3 hours a day in their email, according to The Huffington Post, based on research from Adobe Systems Inc. That’s about 31.5 hours a week or 1638 hours a year. Collectively, workers spend about 4.2 trillion (trillion!) hours in email each year, summed from statistics culled through the U.S. Bureau of Labor, McKinsey Global Institute and The Radicati Group, Inc. That’s an impressive number of hours spent shuffling a depressing amount of email. There are no other channels that are as effective and efficient as email. But are we using it well or only well enough for content marketing and distribution? Sure, you shoot out your latest or greatest content through a campaign or newsletter once a week, but is that really enough? Can’t we do better? Employee email lets you distribute content to your coworkers for education and enablement. And it allows you to pass it on to your network of customers, prospects and leads.